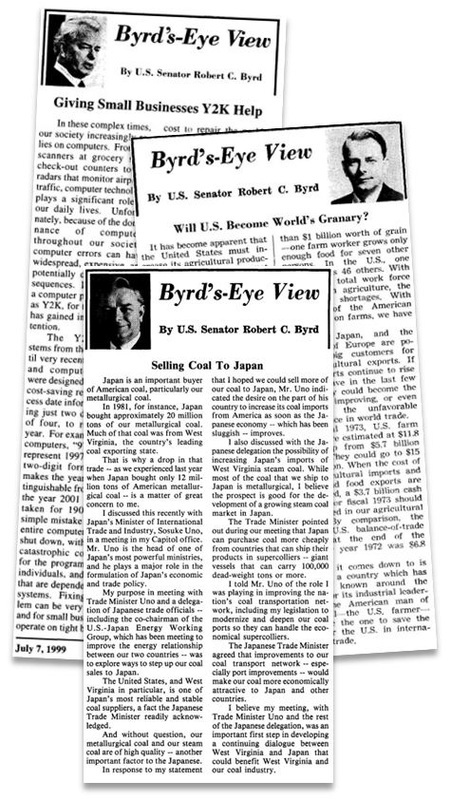 Beginning in 1961, Senator Robert C. Byrd's office issued a weekly newspaper column entitled Byrd's-Eye View. The columns conveyed news from the U.S. Senate that affected the people of West Virginia as well as short opinion pieces by the senator on various topics and occasions. Newspapers through West Virginia printed the Byrd's-Eye View weekly. All told, there are over 2,500 columns spanning almost fifty years and the majority of Senator Byrd's career. *The 1961-2010 file contains all 2,500+ Byrd's-Eye View columns. This is a large file, so please be advised that the file may take several minutes to download.